Vessel Sink?? - When I first saw one, didn’t like it! - Was I wrong! 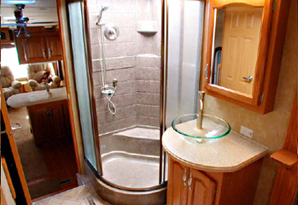 Upper left snap-shot shows our standard 34” neo-angle shower and bathroom sink. The upper right snap-shot shows our larger SKP 36” neo-round shower with foot-rest, home style shower mixer valve and new SKP Vessel sink with vastly improved useable counter-space. 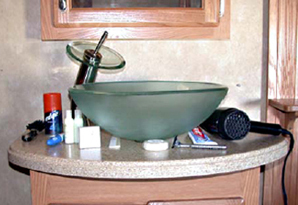 Additional space under the Vessel sink suddenly creates space for hair dryers, brushes, combs, tooth paste, cosmetics, etc. and all those bathroom small toiletry items that, in most fifthwheels, just can’t find a comfortable use space. Check out the “found” bathroom counter space in the above snapshot. For those of us with “bad” backs, there is another plus. The sink is raised high enough so that you don’t have to bend over very far, to practically use the sink bowl. The 16” round bowl is also set out from the wall far enough, that brushing teeth and washing hair does not cause your head to run into the medicine cabinet. I didn’t realize this added great feature until I actually traveled in my personal SKP model Americana. And the space below the sink has more storage as there is no drop down bowl using that important space. As with most of us, when we are exposed to something new, we are not sure we like it. And I knew I didn’t like vessel sinks! Why would anyone spend that much money for something like that, I thought to myself and I started to walk away from the display. I got about 25’ away and I suddenly stopped, and went back for another peak, as I then realized that the Vessel sink only touched the countertop in a small area and there was a huge amount of usable counter space under the sink, where a normal sink would be located. I thought, now we’re cookin’! 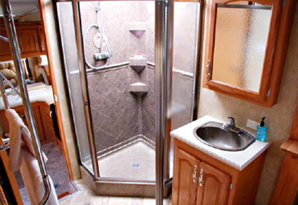 That is just what our fifthwheels need: More usable counter space. Counter space saving Vessel sinks are now part of our SKP package, along with the larger 36” new round shower and wider/deeper solid surface counter tops shown in the above snap-shot.